To create precast elements with Advance Concrete entities, use the formwork functions from the "Advance Formwork functions" toolbar. For example we will create a precast column that is used in industrial buildings. First, using AutoCAD commands create the solids that make up the column. With the polyline draw the contour of the solids and then, using "Extrude" from the "Modeling" toolbar of AutoCAD, create the solids. Do not forget that the contour of the solids can be made only in the XY plane. 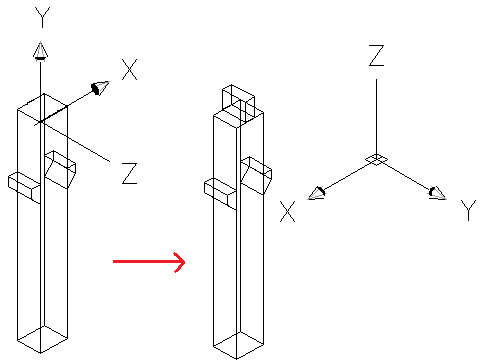 To create the cantilevers, rotate the UCS so that their contour will be in the XY plane and the extrusion is made in the same plane. The same principle is used to create the top side of the column. Next, convert the ACIS solids into Advance Concrete structural elements using the "Convert 3D ACIS solids to structural" command. Select the command and choose the solids to convert. Select the body of the column, press "Enter" and a dialog box will appear where you can select the structural type. The cantilevers and the top side of the column which are still solids, can be bound to a structural element, in this case the column. This can be done with the "Bind 3D ACIS solids to structural" command. Select the command and then the structural element and the ACIS solids to bind. All the solids are connected to create one single element - the column. If the user wants, for example, to create independent cantilevers, these can be unbound from the structural element using the "Unbind 3D ACIS solids from structural" command. Select the command and the solid to unbind. The program will display a warning message. This way the cantilevers will be unbound and can be converted to beams with the conversion command. The user can create different structural elements and can associate properties of Advance Concrete elements by conversion.